In 2009 Juan Arechavaleta won his first championship, braking the Wilfredo Pomes´regining in the series. At this new year Arechavaleta and a lot of drivers left the Chevrolet but a lot of kart drivers came to the series to do their first races in the national open wheel. First of all, delete old mod and if you have them, the 2009 season. With a lot of proud present now the Formula Chevrolet Challenge 08-10, the Simulator + Autodromo de Salto 1.0. 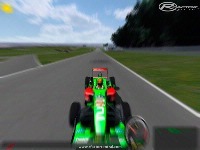 - New physics, engine and gearbox, as the formula have. - All fans and people 4 the support. - Added 2009/2008 cars and 2009 season for offline play. There are currently no setups for Formula Chevrolet Uruguay X. Add a Setup. There are currently no car skins available for Formula Chevrolet Uruguay X. If you are a painter you can share skins for this mod via the Car Skins area. Visit the Spray Booth for painting tips & tricks. Exelente trabajo sigan!!! saludos de otro charrúa!!! Big and fun mod....Continue the good work. whick link is the one for the 2010 cars ?